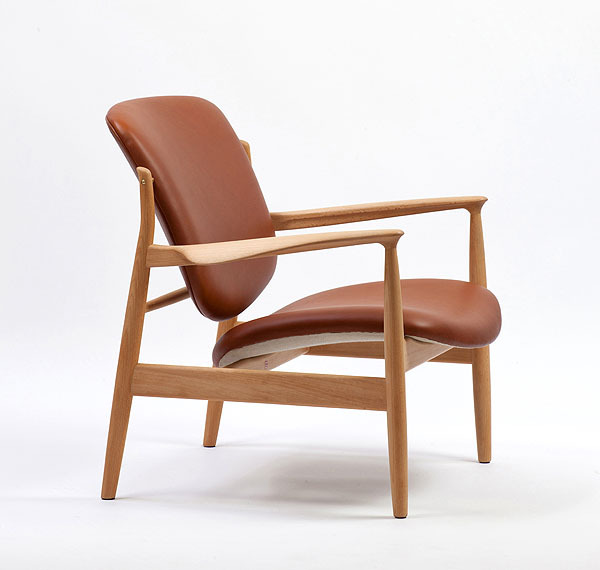 Finn Juhl‘s elegant France Chair makes a comeback. 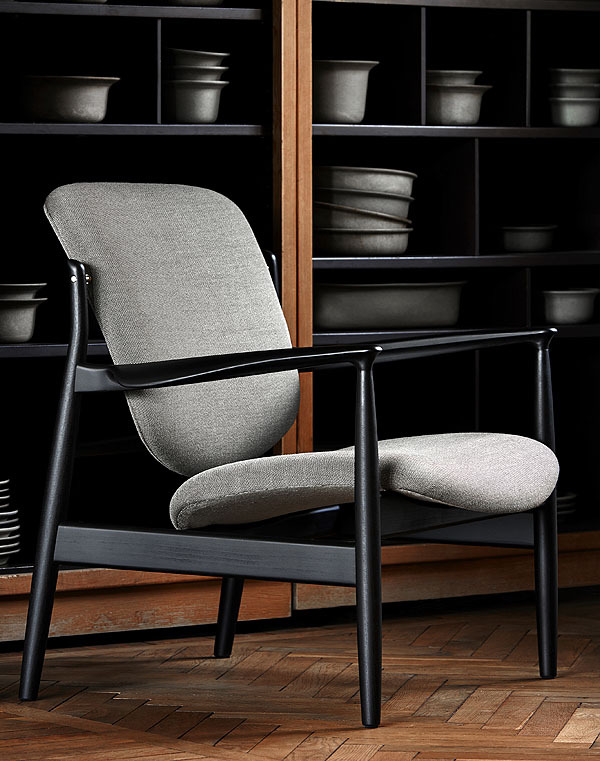 First presented in Milan at Salone del Mobile by Danish furniture manufacturer Onecollection, Finn Juhl’s stylish France Chair will be available at Triode next month in Paris. This particular chair played an important role in one of Danish design history’s biggest – but least known – adventures. It is the story about how a British pioneer, named Mr. France, kick-started a Danish export phenomenon. Only very few people are aware of the fact that the remarkable success of Danish Mid-Century Furniture Design in the 1950′s is to a large extent owed to a British entrepreneur, C.W.F. France. He came to Denmark in the 1930′s to help a Danish friend run his mattress factory. When the Germans occupied Denmark during WWII, he was sent to Germany as a prisoner of war. During the five years he languished in prison, he formulated his groundbreaking business plan, which he put into practice upon his return to Denmark during the 1950′s and 60′s. 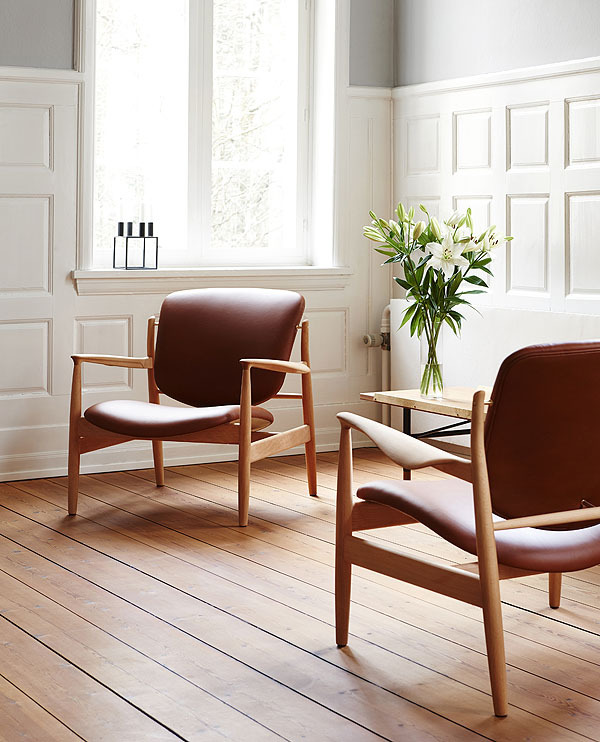 C. W. F. France identified and started partnerships with the most promising Danish furniture designers – most prominently Finn Juhl. The designers developed furniture of a very high standard, which were produced at an industrial scale and sold flat-packed. This strategy paved the way for exporting the furniture at a fraction of the usual cost. It became an enormous success. In the middle of the 1950′s the company, which had now been renamed France & Søn, manufactured 60% of the total Danish furniture export and employed 350 people at its peak. 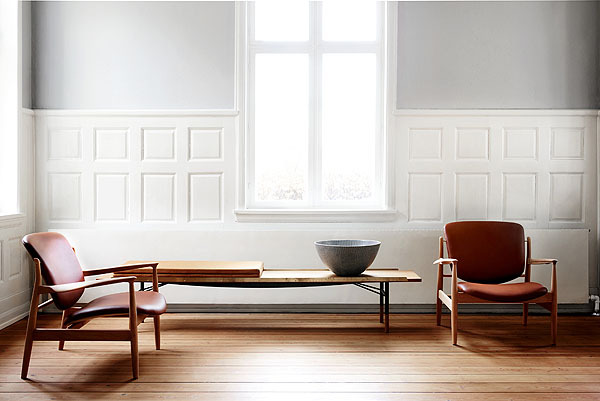 Danish design became trendsetting in Germany, the UK and not least in the USA, where the term Danish Modern became internationally known – a movement that has seen great revival today. 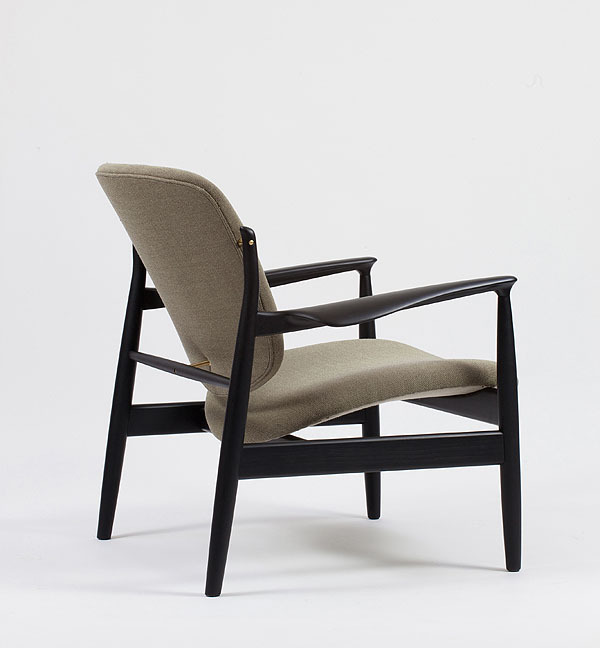 In 1956, Finn Juhl specifically designed the FJ 136 – which was the chair’s original name – for France & Søn. The chair was aimed at the American market where it received considerable success together with a string of other Juhl designs. Since the chair was designed for industrial production it has a more simple construction than many of Juhl’s other designs. However, the chair still maintains the characteristic shapes and distinct separation between the carried and the carrying elements. The chair’s upholstered elements, which seem to be floating, as if they were liberated from gravity, make the chair almost aerodynamic. Also the detailed, organic shaped armrest is a typical characteristic of Juhl’s design. The France Chair, which Onecollection has renamed with permission from C.W.F. France’s son James, is produced in Denmark just like the original model. Today the chair is delivered fully assembled. Owner of Onecollection, Henrik Sørensen, explains why the chair’s history is so unique : ”Just like today, there is no point in being a genius if nobody knows. 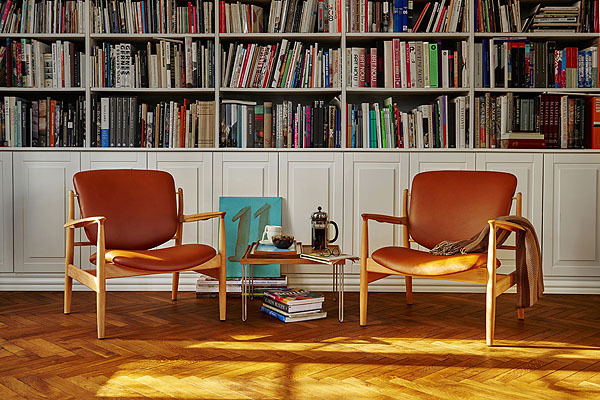 Finn Juhl sparked a trend with his artistic design idiom and unique design, but Mister France was the one who managed to spread the word throughout the world. The story about Mister France is part of the great Danish design history that everybody in Denmark is so proud of – and the France Chair is a beautiful exponent of this”. Read more about C.W.F. France and his Danish furniture adventure in a new book written by his son James France with an introduction by Sir Terence Conran. The book will be launched by the publisher VITA on April 12th. About Onecollection. Onecollection was founded in 1990 by Ivan Hansen and Henrik Sørensen, who still runs the company – and passionately provide design solutions of high quality in cooperation with excellent designers. 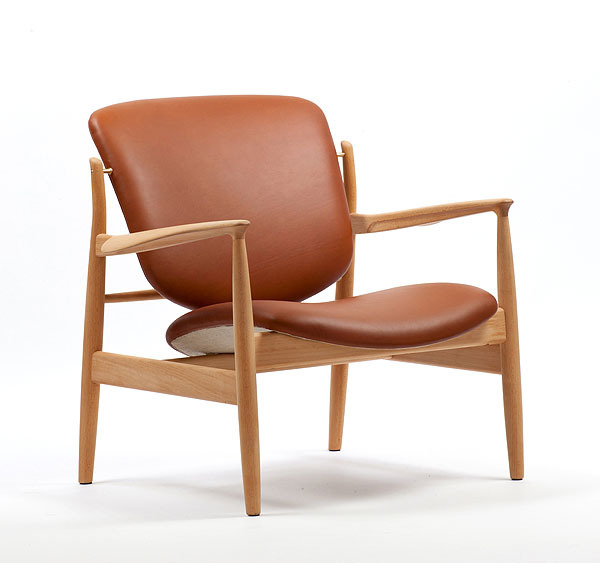 In 2001, Onecollection achieved the exclusive rights to produce Finn Juhl’s sculptural furniture, and today, the unique Finn Juhl collection consists of 40 exclusive masterpieces, which are manufactured with the utmost respect for their heritage. About Triode. The opening of Triode in 2004 was for Jacques Barret the culmination of a rich and varied career in which design, particularly furniture and lighting, have always played an essential role. As “House of Finn Juhl Paris,” Triode is the exclusive distributor in France for the re-editions of Finn Juhl produced by Onecollection. The showroom also presents lighting and furniture by leading contemporary American designers, including Lindsey Adelman, Roll & Hill, Bec Brittain and Bassam Fellows, among many others.